Ancient Madurai, in the state of Tamil Nadu, carries the title as having been one of the oldest continuously inhabited cities in the South India. Situated on the banks of the Vaigai River, the temple city Madurai was the capital of the Pandyan Kingdom, one of the three monarchies of the Sangam Age (1st century AD – 3rd century AD). 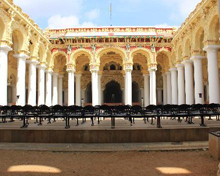 The city epitomizes the proud history of Tamil culture in its very appearance and contains sites from ancient temples to relics of the past. 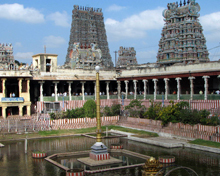 Make a visit to Madurai India and you will come across with a symbol of Hindu India in the spiritually important Shree Meenakshi Sundareswarar Temple, the number-one attraction of Madurai that draws thousands of pilgrims every day. Built between the 16th and 18th centuries, this magnificent structure features 12 towering gopurams (pyramidal gateways) covered from top to bottom in a profusion of Disneyesque coloured images of gods, goddesses and mythical figures. During a Madurai tour, visit the Thirumalai Naicker Mahal, a fine specimen of Indo-Saracen style built by Thirumalai Nayakar in 1636. Gandhi Museum contains the original blood-stained garment of Gandhi when he was assassinated by Nathuram Godse in 1948. St. Mary’s Cathedral in Madurai is frequented by pilgrims in large number. Another excellent attraction to visit during your Madurai vacation is the Kazimar Big Mosque (Periya Pallivasal), the oldest mosque in the city dating back to the 12th century AD. 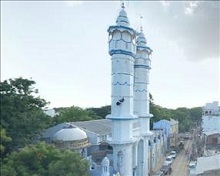 Vandiyur Mariamman Teppakkulam, Koodal Azhagar Temple, Tiruparamkundram Temple and Kochadai Village Deity Temple are popular attractions of Madurai.